We’ll provide some insights and review some of our DFS value players for week 6. 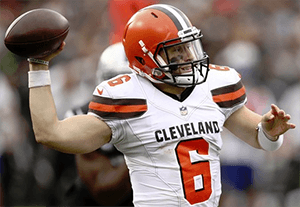 Baker Mayfield (CLE) – Salaries: DraftKings (DK) – 5500, FanDuel (FD) – 7100. Mayfield’s upcoming salary ranks him 17th/18th on DK/FD, respectively for the position. Mayfield posted a 25/43, 342, 1:1 line and 2-23-0 on the ground against the Ravens last week. Mayfield’s fantasy points of 21.98/18.98 ranked him 13th/15th on DK/FD, respectively. Mayfield’s price per point efficiency ranked him 10th/14th on both DK/FD. The betting lines with the Chargers has the game total at 44.5 points with the Browns as +1 point home dogs. The Browns’ implied team total is currently at 20.25 points and the Chargers are currently at 21.25 points. The Chargers rank 23rd against QBs in fantasy points allowed to QBs and 27th against WRs. The Chargers’ defense also ranks 16th in DVOA against the pass and 19th in pass yards allowed with 270.2/gm. Derek Carr put up a 24/33, 268, 1:1 line against the Chargers last week. Mayfield has averaged 318.5 yards/gm and 42 attempts in his two starts this season. His air yards avg. of 9.1 ranks him 6th amongst active starters. With this usage, Mayfield’s passing yardage has a good shot of clearing 300. Mayfield will get a better matchup this week than compared to last week’s reasonable showing against a tougher Baltimore pass defense. Jameis Winston (TB) – Salaries: DraftKings (DK) – 5800, FanDuel (FD) – 7400. Winston’s upcoming salary ranks him 14th/15th on DK/FD, respectively for the position. Winston will be making his first start this season. The betting lines with the Falcons lists the game total at 57.5 points (2nd highest on the board) with the Bucs as -3.5 point road dogs. The Bucs’ implied team total is currently at 27 points and the Falcons are currently at 30.5 points. The Falcons’ defense ranks 29th against QBs in fantasy points allowed and 28th in DVOA against the pass. The Falcons also give up the 9th (tied) most pass yards per game with 277.2 and rank 31st in points allowed with 32.6/gm. The Falcons’ defense ranks 27th (tied) in sacks with 8 and 23rd (tied) in takeaways with 5. Ben Roethlisberger put up a 19/29, 250, 3:1 line against the Falcons last week. The Falcons are equally bad against the run, but Tampa Bay ranks 30th in rush yards. If the negative game script holds for Tampa Bay, Winston should have ample attempts to try to keep pace with Atlanta’s offense in this projected shootout. 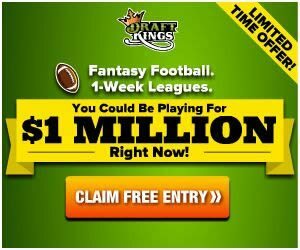 Carson Wentz (PHI) – Salaries: DraftKings (DK) – 6100, FanDuel (FD) – 7500. Wentz’ upcoming salary ranks him 10th/13th on DK/FD, respectively for the position. Wentz posted a 24/35, 311, 2:0 line and 5-26-0 on the ground with a lost fumble against Minnesota last week. Wentz’ fantasy points of 25.04/21.04 ranked him 8th/12th on both DK/FD. Wentz’ price per point efficiency ranked him 9t/11th on DK/FD, respectively. The betting lines with the Giants lists the game total at 44 points with the Eagles as -3 point road favorites. The Eagles’ implied team total is currently at 23.5 points and the Giants are currently at 20.5 points. The Giants’ defense ranks 22nd against QBs in fantasy points allowed, 8th in pass yards allowed per game with 229.4, and 19th in points allowed with 25.6/gm. The Giants also rank 22nd in DVOA against the pass. Cam Newton put up a 21/35, 237, 2:2 line and 8-29-0 on the ground against the Giants last week. RB Jay Ajayi (ACL) has been placed on IR. Corey Clement (quard) is practicing and is expected to return, joining Wendell Smallwood in the backfield. It was nice to see Wentz add some rushing to his game which will help to make his overall game more effective. Wentz has averaged 329.5 pass yards and 2 TDs over his past two games. Nyheim Hines (IND) – Salaries: DraftKings (DK) – 5100, FanDuel (FD) – 6300. Hines’ upcoming salary ranks him 23rd/21st on DK/FD, respectively. Hines posted a 15-45-0 rush line and 7-45-0 on 9 targets at New England last week. Hines’ fantasy points of 16/12.5 ranked him 18th/21st on both DK/FD for the position. The betting lines with the Jets lists the game total at 45 points with the Colts as +2.5 point road dogs. The Colts’ implied team total is currently at 21.25 points and the Jets are currently at 23.75 points. The Jets rank 18th against RBs in fantasy points allowed, 15th in DVOA against the run, and 11th in DVOA against RBs in the pass. The Broncos’ RBs combined for a 17-92-0 line and 11-95-0 on 14 targets at New York last week. RB Marlon Mack (hamstring) practiced Monday and it is plausible he returns this week. The Colts offense ranks 29th in rush yards per game and 26th DVOA in the run. Regardless of Mack’s return, Hines acts as the passing back/slot receiver. TY Hilton’s (hamstring) status is currently unknown at this time, but his return would dampen the ceilings of all the other Colts receiving options. Either way, expect Andrew Luck to dish out a heavy number of attempts. Hines has 3 red zone TDs on the year, 2 coming by air. WR TY Hilton (hamstring) and TE Jack Doyle (hip) have been ruled out for week 6. Tarik Cohen (CHI) – Salaries: DraftKings (DK) – 4600, FanDuel (FD) – 5900. Cohen’s upcoming salary ranks him 33rd/36th on DK/FD, respectively. Cohen posted a 13-53-0 line and 7-121-1 on 8 targets against Tampa Bay in week 4. Cohen’s targets, catches, and yards were all team highs that week. The betting lines with the Dolphins lists the game total at 42 points with the Bears as -3 point road favorites. The Bears’ implied team total is currently at 23.5 points and the Dolphins are currently at 20.5 points. The Dolphins rank 27th against RBs in fantasy points allowed, 9th in DVOA against the run, 23rd in DVOA against RBs in the pass, and 20th in rushing yards allowed with 109/gm. The Bengals’ RBs combined for a 22-93-0 line and 5-25-1 on 7 targets against the Dolphins last week. In week 4, Howard out-snapped Cohen 33(54%) to 29(48%), although Cohen out-touched Howard 20 to 11. This backfield is a committee with Chicago RBs serving different roles, similar to Sony Michel and James White in New England. Cohen isn’t going to ghost in this offense, the matchup is solid, and he’s dirt cheap. Adam Humphries (TB) – Salaries: DraftKings (DK) – 3200, FanDuel (FD) – 4600. Humphries’ upcoming salary ranks him 101st/96th on DK/FD, respectively for the position. Humphries posted a 6-36-0 line on 7 targets at Chicago in week 4. The betting lines with the Falcons lists the game total at 57.5 points (2nd highest on the board) with the Bucs as +3.5 point road dogs. The Bucs’ implied team total is currently at 27 points and the Falcons are currently at 30.5 points. The Falcons’ defense ranks 27th against WRs in fantasy points allowed and 28th in DVOA against the pass. Pittsburgh WRs combined for a 11-140-3 line on 18 targets against the Falcons last week. Humphries ranks 2nd on the team for WRs in snaps taken with 67% behind Mike Evans, however, the target distribution behind Evans is nearly evenly split amongst the rest of the receivers. Humphries works the area of the field where the Falcons’ defense is vulnerable. However, TE OJ Howard (knee) is practicing this week. There are suddenly a lot of potential mouths to feed. Humphries makes for a viable option at a dirt cheap price. Keke Coutee (HOU) – Salaries: DraftKings (DK) – 4600, FanDuel (FD) – 5700. Coutee’s upcoming salary ranks him 48th/46th on both DK/FD for the position. Coutee posted a 6-51-1 line on 7 targets against the Cowboys last week. Coutee’s fantasy points of 17.3/14.3 ranked him 20th/19th on DK/FD, respectively for the position. Coutee’s price per point efficiency ranked him 14th/16th on DK/FD, respectively. The betting lines with the Bills lists the game total at 41 points with the Texans as -9.5 point home favorites. The Texans’ implied team total is currently at 25.25 points and the Bills are currently at 15.75 points. The Bills’ defense ranks 7th against WRs in fantasy points allowed and 7th in DVOA against the pass. The Bills also rank 10th in pass yards allowed per game with 234.6 and 17th in points allowed per game with 23.6. The Bills run the 7th fewest plays per game at 60.8, but the Texans run the 4th most at 71. The Titans’ WRs combined for an 11-115-0 line on 17 targets at Buffalo last week. Deandre Hopkins has the toughest on paper matchup as he should see a lot of Tre’Davious White. Deshaun Watson (chest) and Lamar Miller (chest) are expected to play this week. Coutee provides another viable, cheap WR option this week. Austin Hooper (ATL) – Salaries: DraftKings (DK) – 3500, FanDuel (FD) – 5600. Hooper’s upcoming salary ranks him 16th/12th on DK/FD, respectively for the position. Hooper posted a 9-77-0 line on 12 targets at Pittsburgh last week. Hooper’s fantasy points of 16.7/12.2 ranked him 4th on both DK/FD for the position. Hooper’s price per point efficiency ranked him 2nd/4th on DK/FD, respectively. The betting lines with the Bucs has the game total at 57.5 points with the Falcons as -3.5 point home favorites. The Falcons’ implied team total is currently at 30.5 points and the Bucs are currently at 27 points. The Bucs’ defense ranks last against TEs in fantasy points allowed and 30th in DVOA against TEs. The Bucs’ defense also ranks last in both pass yards allowed with 358/gm and in points allowed with 34.8/gm. Trey Burton posted a 2-86-1 line on 4 targets against Tampa Bay in week 4. Hooper ranked 2nd in snaps for the team with a 76% market share behind only…Mohamed Sanu at 82%. Hooper leads all Falcons players in snaps on the season. Hooper’s matchup looks great but never forget that Matt Ryan hates your fantasy team. CJ Uzomah (CIN) – Salaries: DraftKings (DK) – 3000, FanDuel (FD) – 5100. Uzomah’s upcoming salary ranks him 19th/18th on DK/FD, respectively for the position. Uzomah posted a 2-43-0 line on 2 targets against the Dolphins last week. Uzomah’s fantasy points of 6.3/5.3 ranked him 20th/18th on DK/FD, respectively, for the position. The betting lines with the Steelers lists the game total at 53 points with the Bengals as -2.5 point home favorites. The Bengals’ implied team total is currently at 27.75 points and the Steelers are currently at 25.25 points. The Steelers’ defense ranks 31st against TEs in fantasy points allowed and 25th in DVOA against TEs. The Steelers’ defense also ranks 29th in pass yards allowed with 296.2/gm and 25th in points allowed with 26.6/gm. Falcons’ TEs combined for a 10-85-0 line on 14 targets at Pittsburgh last week. TE Tyler Kroft’s (foot) status is currently unknown after having to leave last week’s game. If Kroft is out this week, Uzomah should see 100% of the TE snaps. Uzomah had been out-snapping Kroft at a 2 to 1 clip anyway. Uzomah gets a great matchup and does have a solid pathway for production. Kroft (foot) has been ruled out for week 6.